The grand majority of trading systems are based upon technical analysis as in the example above; which uses two pieces of technical analysis (moving average and average true range). Technical analysis is best explained as a method of finding trading ideas based upon the analysis of past prices only, with no consideration of so called fundamental factors such as supply and demand. (contrast technical analysis with fundamental analysis which considers a company’s product line, profit margins, management, etc). 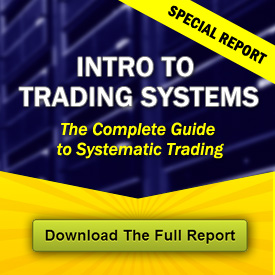 It is important to note a few things that a trading system is not. A trading system is not the same thing as a trading platform. A trading platform is a “front end” piece of software which allows people to enter orders for trading. Trading Technologies, E*TRADE’s online order entry, and TradeStation are examples of trading platforms; and while you can set up a trading system to trade on these trading platforms — they are not the same thing. And a trading system is not a “market letter” or the like in which so called gurus put out support and resistance levels, outright buy or sell recommendations, or sector rankings. These “calls” are not rules based, and cannot be programmed into code; thus are not trading systems. The norm now is for the developer to simply lease the use of the system to clients on a monthly basis through a trading system broker or automated trading system platform such as iSystems. A trading system investment involves the system assist broker running the system software on its machines on behalf of the client and monitoring the system signals minute by minute throughout the trading day, entering any buy and sell signals issued by the system into client accounts, while a monthly fee for the system comes out of the client account.